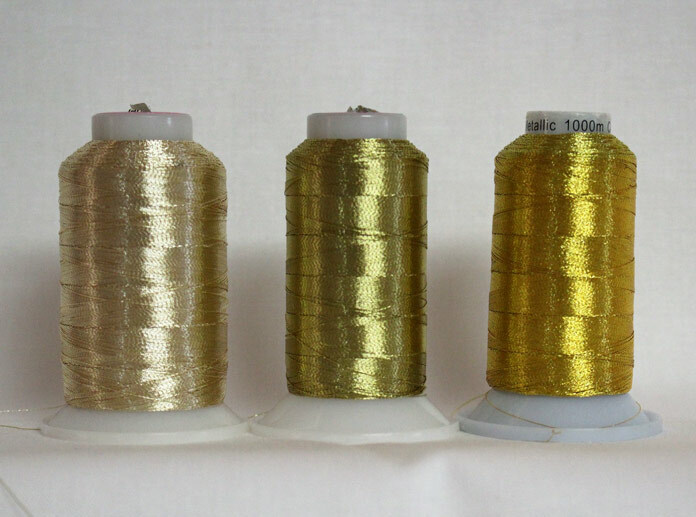 Welcome back to this week’s exploration of WonderFil Specialty Threads Spotlite, a shiny, sparkly thread. Yesterday I talked about 6 tips for using Spotlite on a domestic machine, and what to keep in mind for successful quilting every time. 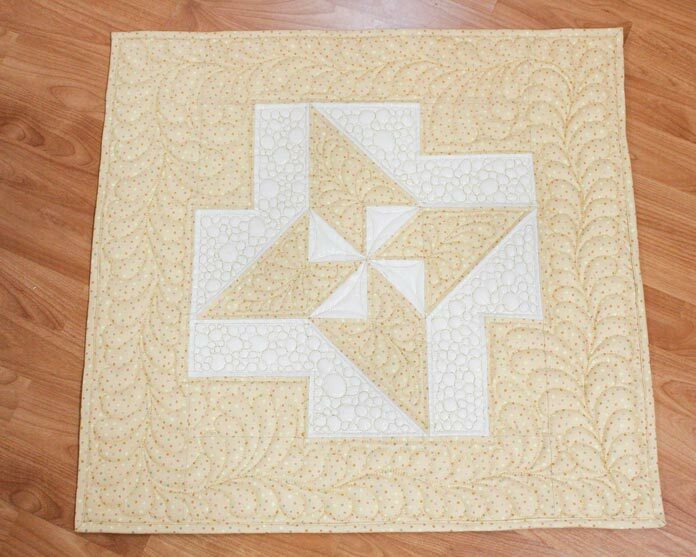 I’m moving along to quilting on my longarm and sharing tips for trouble-free stitching when using Spotlite. Skip a hole in the thread path. 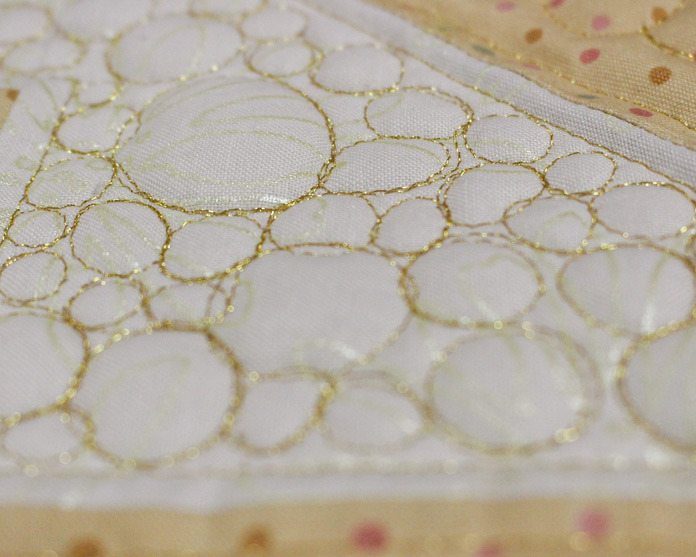 Using metallic thread can require some extra care. Threading the machine is the first step. Just above the tension discs on my longarm machine is a 3 hole thread guide. I generally thread through only 2 of these guides. I prefer to use the larger cones of 1093yds [1000m] on my longarm, but have been known to use the small 164yds [150m] spools for the color I have in my stash. Because the machine stitches at a much faster rate than my domestic machine, I almost always use WonderFil’s Wonderguard wraps to keep the thread coming off the spool smoothly. If one wrap isn’t enough, I’ll double them up to wrap around the larger cones. Spotlight is a wrapped thread. The metallic strands are wrapped around a rayon core. To keep the thread from shredding, use a needle with a larger eye. I mostly use the size 18 longarm needle for smooth stitching. DecoBob is available in size L and M and class 15 prewound bobbins as well as larger spools. Using a finer thread in the bobbin is a very good idea. WonderFil’s DecoBob is an 80wt cottonized polyester thread and is ideal for these purposes. This fine thread that helps to reduce any bulk when the two threads wrap within the fabric, it removes the possibility of any tension issues. 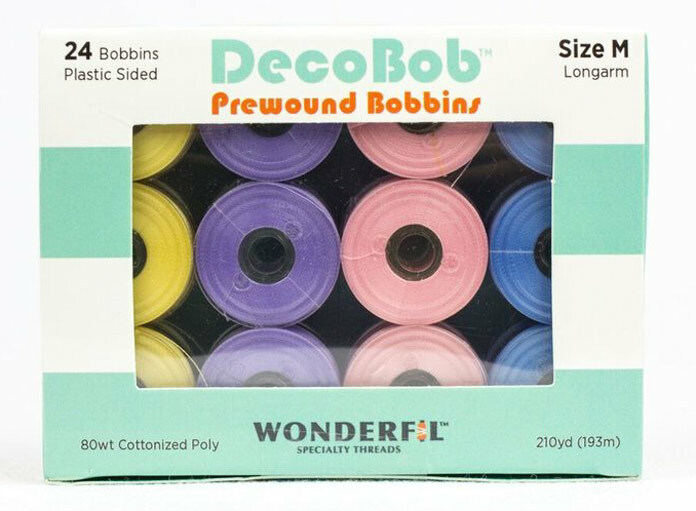 DecoBob is available in 3 sizes of prewound bobbins. Class 15 and sizes L and M will fit most sizes of domestic and longarm sewing machines. The thread is also available in 2 sizes of spools. 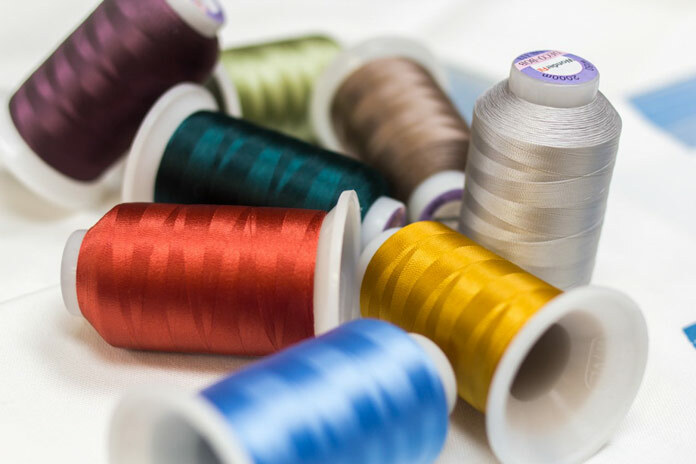 A finer thread, DecoBob is perfect for your bobbin thread. Just because our longarm machines stitch at a high speed, doesn’t mean we have to use a million stitches to the minute! I have a variety of polyester threads that are designed to work on a high speed longarm. I can work really fast and not have any shredding issues. Spotlite and other specialty threads are not designed that way, so be prepared to slow down. Each machine is different and you’ll need to experiment to see what works best for you. When we sew slowly, we tend to shorten our stitch length. I prefer to use the regulated stitch control on my machine and set my machine at 10-11 stitches to the inch or even longer at 9-10 spi. If your stitch length is set too short, the metallic strands are required to fold and bend too tight. This causes tension issues and possible thread shredding and breaking. The longer stitch length also allows the shine to show! The light doesn’t reflect as much when you use a short stitch length. Before you start stitching a project, always do a tension test. Use a small fabric sandwich using the same fabrics as in your quilt and stitch. Use the same speed and stitch length as you plan to use on your quilt. Make sure you stitch straight lines and corners as well as curves. Feel the underside and turn the work over to have a peek at how the stitches look. This is where many quilters will give up! Don’t give up! Adjust your needle and bobbin tensions. If it looks like the bobbin thread is pulling the needle thread to the back of the quilt, you may need to loosen the bobbin tension. If you’re seeing a lot of bobbin thread on top of the quilt, loosen the needle tension. 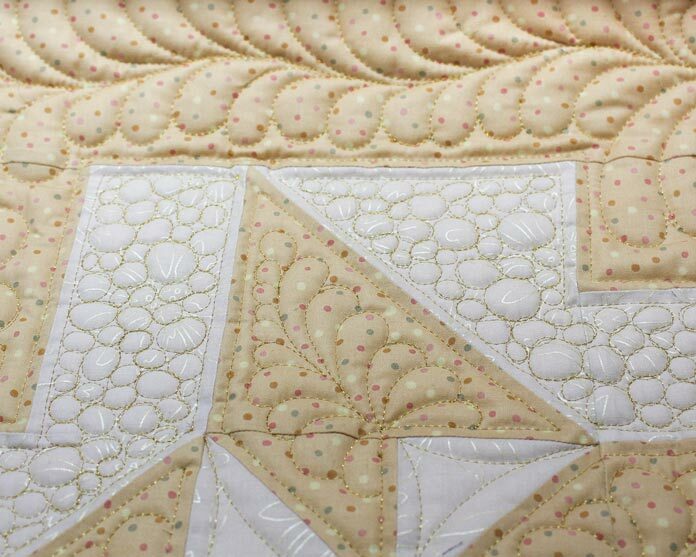 WonderFil’s Dark Gold MT8858 Spotlite shines in simple quilted feathers. 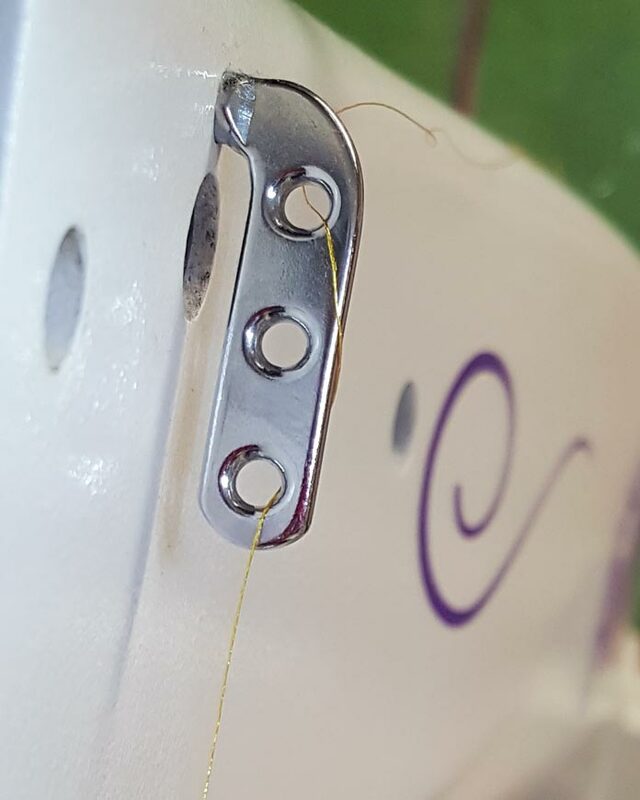 So far, we had a look at 6 tips for using WondnerFil’s Spotlite thread on a domestic and a longarm machine. Join me the rest of the week as I show off more projects and give a few more little tips, tricks and information about how to quilt and work with Spotlite thread.